“Relay For Life is a life-changing event that helps communities across the globe celebrate the lives of people who have battled cancer, remember loved ones lost, and fight back against the disease.” Courtesy of relayforlife.org. On Tuesday, April 3rd, Sonny Nguyen, Century 21 Mortgage Professional, is hosting a luncheon from 11:30am – 1pm. 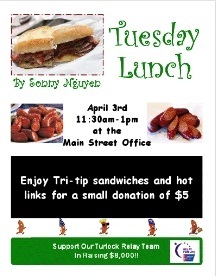 Come and enjoy tri-tip sandwiches and hot links for a small donation of $5.00 at the Century 21 M&M office located at 331 East Main Street in Turlock. Two days later on April 5th, the Century 21 M&M Oakdale office is hosting a Wine and Cheese Event at 1414 East F Street, Oakdale, with over 10 wines to taste, specialty cheeses, and hors d’oeuvres. Cecilia, Sales Manager, says that the donation is $15 a ticket and there will be raffle prizes. 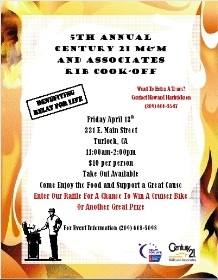 Everyone is looking forward to the Annual Rib Cook-off on Friday, April 13th at the Century 21 M&M Real Estate office at 331 E. Main Street in Turlock, CA. Currently there are 22 cook-off teams confirmed and 8 of those teams are from Century 21 M&M.They will be serving ribs, beans and different kinds of salads. The $10.00 tickets are currently available through the Turlock offices and most of the Turlock Agents. You can pre-order your take-outs so we can have those ready in advance. Based on last year’s attendance the Turlock agents are expecting 700 people in attendance. After dark on April 21st, the Relay for Life participants honor those who have been touched by cancer and remember loved ones lost to the disease during the Luminaria Ceremony. This ceremony will be located at the Dutcher school location after dark at 8:30pm. Candles are lit inside bags filled with sand, each one bearing the name of a person touched by cancer, and participants often walk a lap in silence. 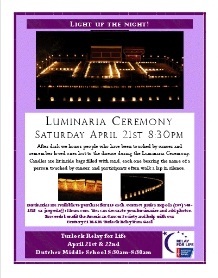 Luminaries are available to purchase for $10 each. 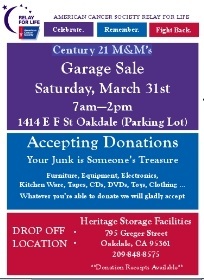 Contact Jessica Zepeda (209) 740-1513 or jzepeda@c21mm.com. You can decorate your luminaries and add photos. 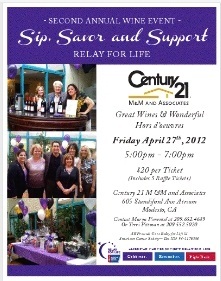 On Friday, April 27th between 5-7pm, the Century 21 M&M Modesto Office is hosting it’s Second Annual Wine Event – “Sip, Savor and Support Relay for Life” in the 605 Standiford Avenue atrium. They will be offering different wines and beer, and some wonderful appetizers and desserts. DJ’s James and Teresa will provide some great tune. The cost is $20.00 per ticket which includes 5 raffle tickets and all proceeds will go to Relay for Life. The Century 21 M&M Madera office are Raffling a Nook color and a PS 3 (donated by Walmart) to help raise money for Relay for Life. We have a Team called the M&M’s. Michale Simmons and Jerilyn Von Flue are the team co-captains of a relay team on May 5-6th at the Town and Country Park at 2400 Howard Rd in Madera CA.